Inspired by the British television show, How to Live Mortgage Free I’ve recently been watching on Netflix and our debt-free, thrifty guy, Charlie – I’ve been considering different ways that I could possibly live mortgage-free. And, I’m not necessarily talking about getting a 6-figure job, saving 50% of your income, working 80 hr work weeks and living only on rice and beans to pay off the mortgage. Though that works. I’m thinking about more creative ways to own your own home without the weight of a mortgage or rent. Owning free and clear OR having your living provided, for free. We’ve interviewed LaMar Alexander – an off-the-grid dweller who’s lived in a 14×14′ home for several years and offers insightful tips of tiny-home living. That’s one way many are turning to living without a mortgage. But what if you have kids? Is this space going to be enough? Here’s a few thoughts. Of course these are dependent on zoning laws and regulations that your city / town has on living spaces – but it could be worth the effort if it ends up saving you thousands of dollars. I hope you chime in with some of your own. In the show, some of the people featured are boat dwellers. So, they pay a yearly fee to dock their boat – so long as they move it every couple of weeks. A bit of a hassle, but at least you get different views! One young gal they profiled had no experience with boats or construction but was able to purchase a 55′ old boat for about $18,000 UK and put another $15,000 to renovate it. After 6 months, she had the thing looking spiffy and customized and it was all paid off! She did a lot of the work herself using found-objects, and painting it herself. But I was surprised at her ingenuity. Do you have family or friends with large plots of land? Perhaps they have a garage, shed or barn that sits empty? These are ways to utilize your existing network and perhaps renovate structures into living spaces. One graphic designer turned her parents abandoned garages into a wonderful home she took over for $12,000 UK. Of course she got a swell deal on the garages – but sometimes there are living areas right under our noses, from people we know / love. At one time a relative of mine was a house-sitter. She’d get to live in these luxury homes for weeks at a time while the owner was vacationing for the winter or away for weeks. She would hop around from one house to the next. It was always fun to visit because we got to see all the different houses and how the wealthy lived. So, not only did she get a free living space – but she was paid to live there for a time. What a sweet gig! The drag on this arrangement would be you’d have nothing stable and would always be having to look for your next house sitting job. But, I think if one were able to make certain connections, it could be done. I’m also thinking here about being a manager / caretaker of an apartment building. Many times the owners will provide free or reduced room and board for someone to stay on-site and manage / “house-sit” the property. When I was first looking at home-buying, I seriously considered getting a loan for a duplex property. Because my income wasn’t very high at the time, some of the duplexes I was considering were in the rougher parts of town. Still, my church was in the area and knew of others putting down roots, so I knew I would have people I could be around and not be a lone wolf. The attractive thing about duplex/triplex/fourplex-living is that you have multiple separate living areas in one home. Renting these out can pay for your mortgage and may even pay you to live there. Of course, one needs to factor in taxes, repairs and other expenses, but this is one unique way to live somewhat mortgage-free. Whether you are spreading the Good News or you’re an upper level executive, obtaining the right job could land you with a home allowance. I know of many pastors / priests / nuns who have their homes provided by their churches / perishes. Not a bad deal for taking care of the flock! But for the lay people, these benefits usually go to upper management. Is it worth climbing the ladder for this sweet arrangement? 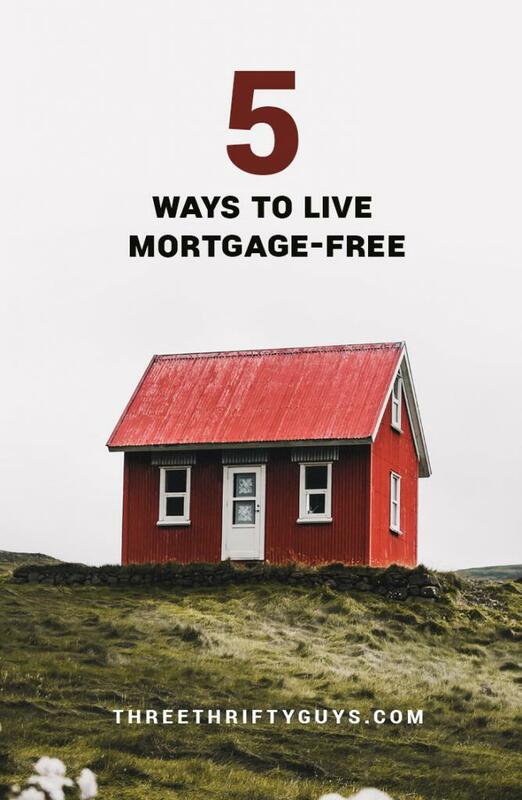 How about you – do you have any unique ways to live mortgage-free? We made a three house plan to be mortgage free. First house was new construction in an upcoming area. Lived 3 years then sold it for 20k more than we paid. Second house smaller in a fixer up neighborhood lived 5 years. When all the other homes sold we had people leaving notes on the door wanting to buy. Sold for 50k more than bought. Our current house is a nice condo in a great area. Between the original down payment and the profit from last 2 homes were able to pay cash for it. Mortgage free is doable if you plan for it. Smart Mary! Taking advantage of a good market, for sure. At one point when I was in university, I considered living out of my car to make enough money to travel. Since then my needs have changed ;) Love these especially the boat idea. Maybe one day we’ll do that! Oh, that would have saved a lot of money. Can’t say I ever met any student who did that back in my day. Seems like it may be more acceptable today.